BestSub has just added new colorful flip cases to our iPhone case collection, with purple, blue and black cases available. These cases are designed with a protective flap to enclose and protect your iPhone screen, as well as an imprintable area on the back of the case to personalize it with your own style. Please note, for all iPhone case collections, BestSub can provide aluminum and metal inserts for cases that feature the insert option on the case. Apple explains in its iPhone 5C event that the colorful expresses a feeling and reveals personality. Sadly, Personality can hardly be expressed completed only by color. When a large number of apple funs just hold the same colorful handset, they would find few confidence to call that a fashion. While, the printed colorful iPhone 5C cases are could really do. When the bright color accompanied by your favorite picture or personally design image, yourself brand will suddenly come to a vast stage, showing people what you are different. To accomplish iPhone protection and fashion generation, BestSub has developed the new foldable cases series for Apple's iPhone 5C. The case is composed of the outer PU case and the inner PC cover, sticking to each other. The PC cover tightly matches iPhone 5C, and the outer PU case leaves blank polyester surface in the front for sublimation printing. The magnetic button as well as the inner card slots highlights the feasibility of this item, making it friendly to use. In order to tag difference and charm to your iphone, BestSub developed a new kind of luminous iPhone cover for your need and protecting the phone at the same time. The cover is highlighted by its capacity to glow at night. This property gives it special attractiveness, expecting large market demand in youngsters. With the popularization of Apple iPhone, protective iPhone covers come to the stage of electronic fashion market. Now, the new brand new iPhone 5 handset is coming strong with its extraordinary popularity. As a rule, numerous iPhone 5 covers will appear, while hardly could we find a cover which can take full size printing, especially on the edge area of the cover. But now, we have it by BestSub's R&D efforts. When Apple and Samsung take the primary market share in the electronics market, HTC comes back with the new G23 One X. The new G23 One X handset interstates HTC's great tradition in entertaining design, which adds extra credits to its marketing. As a fashion protector, BestSub, as we did, publishes the One X cover. With the optimistic market expectation, we are confident with the demand. BestSub achieves the G23 One X cover with the mature technologies that has been proved on our numerous products. The cover comes with reasonable design, fashionable decoration and user-friendly concept. With the popularization of Apple iPhone, protective iPhone covers come to the stage of electronic fashion market. Too much iPhone covers have we seen in the past 2 years, while hardly could we find a cover which can take full size printing, especially on the edge area of the cover. Thank god, we have it now by BestSub's R&D efforts. The material of the cover, plastic, is carefully chosen after taking into account of protection and decoration. 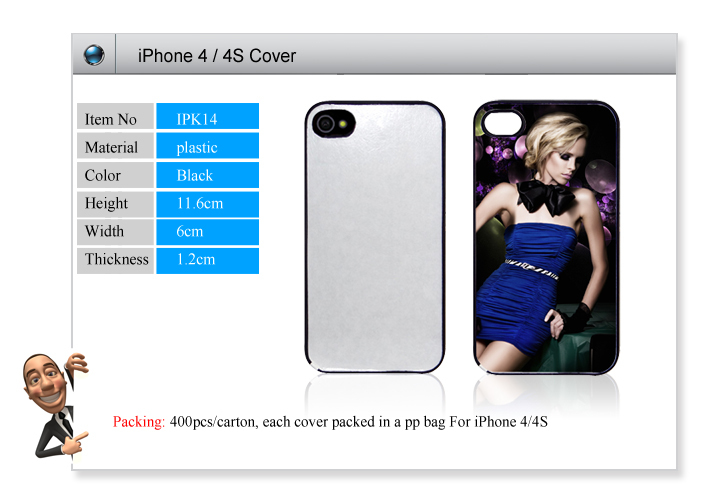 With the tight design, the cover is surely to protect the iPhone handset in an effective manner. Unveiling your personal unique style with an effective protection shell; free photo imprint and vivid printing effect giving you the platform of personal statement. 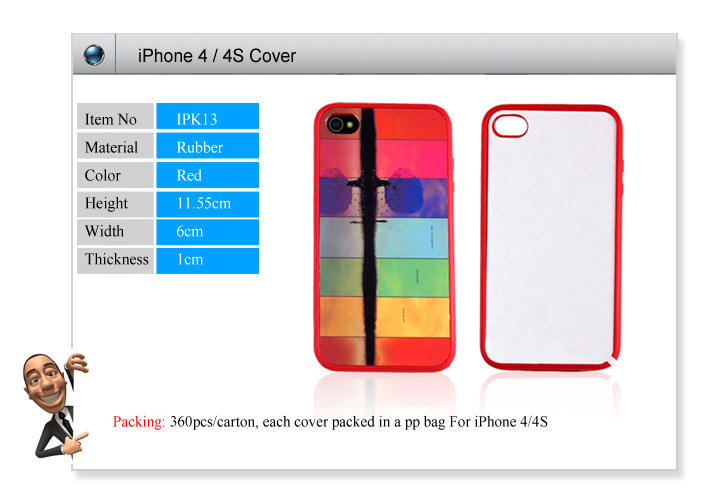 After spending countless efforts, BestSub is proud to unveil our new fashion cover for iPhone 4/4S. Being tailor-made for this cell phone, the cover provides effective protection from dust, damage or any other unexpected situations. It would sweep around the global market with its excellent performance and be recognized as a protective skin of your iPhone. Relying on a computer, an inkjet printer and a digital photo incorporating with your ingenious talent, you are in full preparation of make yourself an exclusive gift. BestSub is devoted to customer’s interest and satisfaction with top quality, best service, fast delivery and abundant stock. With the spirit of mutual benefit, we are looking forward to building up business cooperation with friends from all over the world. 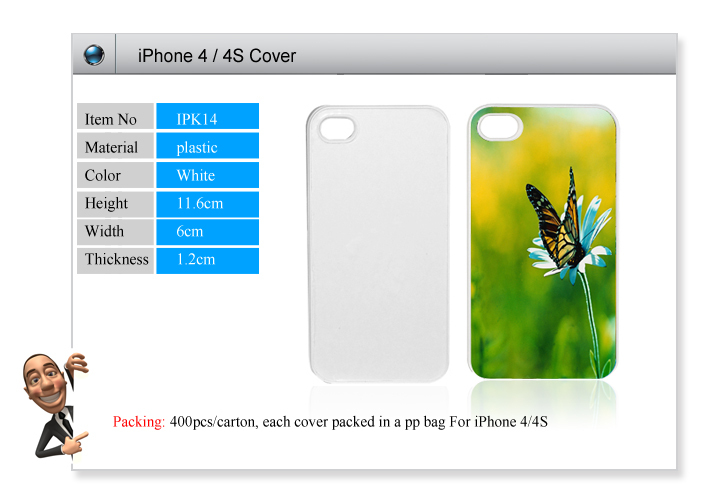 Copyright © 2011 Sublimatable Blank Cases - Sublimation iPhone Cases,iPhone Covers,Samsung Cases,iPad Cases. All Rights Reserved.